Discovering new places in my own city ranks high on my ‘favorite things to do’ -list. When you go someplace new and exciting, but close to home, it can almost make you feel like you had a mini- holiday without the hassle of having to pack and travel. This is exactly how I felt when I was recently invited to Hôtel Droog for the perfect sunday brunch. I love sunday brunch because it gives you the chance to sleep in, legally skip breakfast (I am not a big breakfast fan), enjoy the perks of a long lunch, but at the same time have the whole afternoon left to do other fun things. Hôtel Droog is located in the historical center of Amsterdam in a very charming old building. 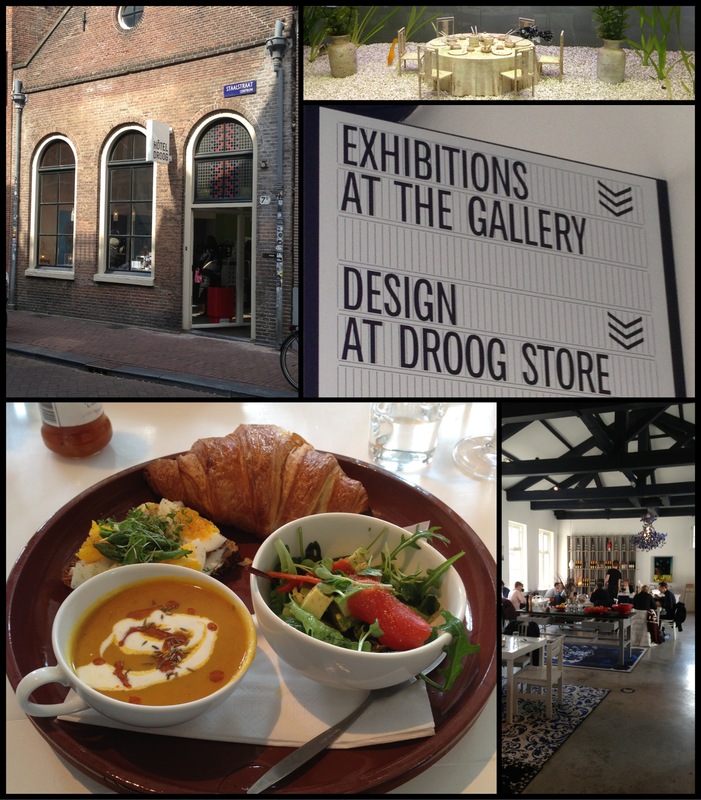 I already knew that Droog, a Dutch design company, had a shop and exhibition space here, but I had no idea that there was also a restaurant in the attic of the building. In this very inviting space, called the Roomservice Cafe, they serve fresh, home-made and delicious food and drinks from early lunch to early dinner. Besides several shops and a cosmetics store, there is also a single hotel room in the building which explains the name Hôtel Droog. Back to the food now >> As we could not decide what to order from the menu (because it all looked so good!) we opted for the tasting menu. The menu consisted of carrot/apple/ginger juice, a soy- milk cappuccino, pumpkin/carrot and cumin soup, a piece of toast with a boiled egg topped with green asparagus, an organic wild smoked salmon and avocado salad and last but not least a very good croissant. Not a bad way to start your sunday! Apart from the soup, which had way too much cumin in it for my liking, everything else tasted and looked great. Unfortunately I had zero appetite left after this feast, but I will definitely come back to try one (or maybe two) of their delicious- looking cakes. If you happen to be in the neighborhood or are racking your brain about a nice brunch spot for next sunday, please remember Hôtel Droog and treat yourself. I promise you that you will not be disappointed! You might even find yourself a nice souvenir in the downstairs shop on your way out… I know I did.